ANN ARBOR, Mich. (AP) — No. 4 Michigan has one last chance to fine tune its team against a lesser opponent before playing championship-caliber teams. The Wolverines (9-1, 7-0 Big Ten, No. 4 CFP) are favored to beat Indiana (5-5, 2-5) by more than four touchdowns in their final home game of the season. Then, things get kicked up a big notch. Michigan closes the regular season at No. 8 Ohio State, desperately hoping to beat its rival on the road for the first time since 2000. If the Wolverines finally win in the Horseshoe, they will advance to the conference championship for the first time. And, a Big Ten title would likely put Michigan in the College Football Playoff. “We’re in a beautiful position where we control our own destiny,” Wolverines linebacker Josh Ross said. Staying motivated game to game, with a matchup looking against the Buckeyes, has been accomplished. Indiana has two chances to pick up the one win it needs to become bowl eligible for the third time in four years. The Hoosiers haven’t won at Michigan since 1967 and they may be underdogs at home next week against rival Purdue. After ignoring the postseason chatter last season, coach Tom Allen is freely talking about the scenarios. Grant Perry will be among the Michigan seniors honored before the game, an experience the receiver from suburban Detroit is eagerly anticipating. Perry was in Jim Harbaugh’s first recruiting class at Michigan. Fifth-year seniors, such as defensive end Chase Winovich and defensive back Brandon Watson, were signed by former coach Brady Hoke. Indiana has forced a Big Ten-best 24 turnovers, ranking fourth in major college football, and has a takeaway in 16 straight games. The Hoosiers share the FBS lead with 13 fumble recoveries and are No. 25 in interceptions, picking off at least one pass in nine straight games. 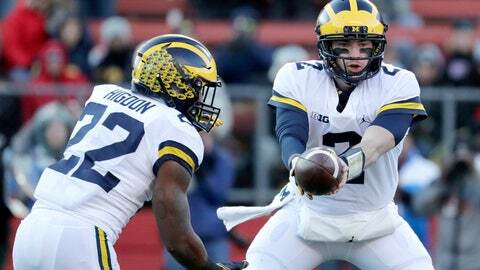 Michigan’s Shea Patterson is one of five finalists for the Unitas Award, which recognizes college football’s best upperclassman quarterback. He has completed 67 percent of his passes with 19 touchdowns and just three interceptions. The former Ole Miss star has career highs with 187 yards rushing and two scores on the ground. Mike Hart ran for a school-record 5,040 yards at Michigan from 2004 to 2007, but he won’t be wearing maize and blue on Saturday. Hart is Indiana’s running backs coach and among the nominees for the Broyles Award, which honors college football’s top assistant. He has coached Stevie Scott, who is second among the nation’s freshmen with 894 yards rushing. Indiana offensive coordinator Mike DeBord has had two stints as an assistant with the Wolverines and quarterbacks coach Nick Sheridan played at Michigan.